The first batch of nine boats was under way by early 1952, this taking place in a workshop above Jack’s family run butchers in Taunton. In general, Jack constructed the boats as far as the basic hull without ribs, from this point on the owners (with help and guidance) could then complete the boats themselves. Part of the process required the individual owners sanding their own planking before construction commenced! Interestingly caulking was laid between the lands as the build took place. Roy Perry (at the time A.Y.C. secretary) can remember an innovative method of drilling rivet holes to avoid catching the caulking by using sharpened bicycle spokes – much to the delight of an Ilminster bicycle shop owner who had a supply of war time un-galvanised spokes that proved highly effective. 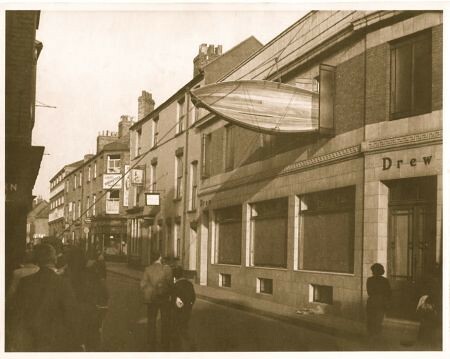 The semi-completed hulls were lowered out the upstairs workshop window into the street below, an interesting black & white photograph survives, highlighting the event. The final stage of construction was completed either in Jack’s hut on the beach at Axmouth Harbour, or various owners homes around Axmouth and Seaton. The original sails were made from cotton, being produced by Ooly Von Tyska at his shirt factory in Taunton. Again the individual owners were involved in finishing the sails, having to sew on bolt ropes and cringles to complete the sails. Unfortunately the quality of the cotton had a tendency to stretch, so the sails were soon replaced by terylene; however Roy Perry still has set of the original cotton sails, carefully washed and ironed! The majority of the terylene sails were white, but a few opted for dark blue. The A.Y.C. AGM minutes for February 1953 record that Jack was then completing his own boat, No.1 – Whimbrel and that Peter Spanton’s No.2 was already sailing. Ken Tolman owned No.3, Roy Perry No.4 and Ooly Von Tyska No.5. In 1954 Ron Harwood (later A.Y.C .President) presented Graham Davis (President in 2005) with the materials to construct an Axe One Design for his 21st birthday. 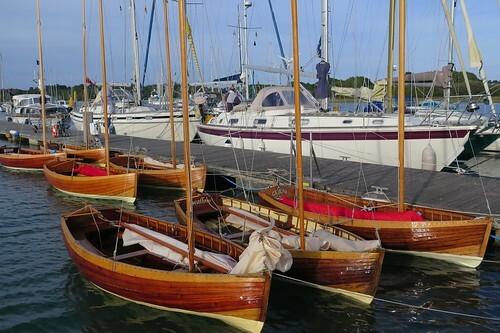 Gemini, No.8; was built from the planked stage to completion by Graham and Ron in Epsom, the only boat of the original batch to have been built away from the area. Fortunately Roy Perry has kept the original invoices which make interesting reading today! Obviously this represents a considerable saving on having the boats built professionally, quotes at the time were in the region of £120.